This is the final of our guest-blogger Sir Justyn’s series – ‘The Horses, The Hawks and The Hounds.’ Enjoy. The third most important animal to nobles of the Middle Ages was the humble hound. So common today are dogs that we can come to neglect their prestige and importance among the lords and ladies of yore. Hounds were considered most noble of beasts based upon his loyalty, kindness and other qualities of great nobleness. As you may have already surmised nobles kept and used hounds primarily for hunting. Of these breeds five were used for robust purposes such as the hunting, guarding and fighting spoken of earlier and were well praised by noble men. The poor little lap hound was considered a ladies hound. They were used for both companionship and to keep fleas off the lady who kept the hound, as written by medieval authors Gaston de Foix and Edward of Norwich! They were somewhat considered the lesser hound, especially among the men. It seems not to be until a few centuries later that men became fond of these small dogs. A hound in a medieval noble’s house was very well kept in almost the same way we might keep our dogs today with sufficient bedding, shelter, warmth, good food, clean water and plenty of room to exercise. Gaston Phoebus, the Count of Foix wrote in his famous book” Livre de Chasse” in the 14thC of a medieval dog pen; “there are two gates to the enclosure; one opened only for the hunt, the other that leads to a sunny outdoor enclosure. The hound house is divided into three sections; one for the hounds, one for the handlers and a third with six sticks with gutters for the hounds to urinate on, the gutters taking their business to an outside area.” He goes on to write that servants must sleep with the hounds and that the kennels are to be kept warm with a fireplace and chimney. Accompanying illustrations in Livre de Chasse show a kennel that looks more expensive than a serf’s cottage. Edward of Norwich, writing his book The Master of Game in the early 15thC, which was largely a copy of Livre de Chasse but with some English flavour and relevant regional changes, suggests instead stones for the hounds to urinate upon and just one child to sleep in the kennels if the kennels are small. He also, like Pheobus, suggests that a chimney and fireplace be set in the kennel for the comfort of the hounds when they are cold or have swam and need to dry out. So what of these hounds not suited for the lap of a lady? Running hounds were used more for boar hunting (though some proved also to be good at hunting deer) and needed to be strong, bold, and fast over short distances. Primarily they used to press a boar and to fight him at close quarters. They were not good at sustaining a chase and gave up the chase relatively quickly. They were not called running hounds for their ability to run but rather to set upon or “run” their quarry into the ground, though it is also hinted that they may be called this because a man can keep pace with them while running. Greyhounds were prized for their ability to chase quarry over a long distance at great speed and without losing sight of the prey or giving up. They were perhaps the most valued of all hounds and their nature as today was kind, not too fierce, playful and joyous. Curiously the greyhound is the only hound mentioned specifically by name of its breed in the Middle Ages, perhaps a testament to their esteemed position among hounds. These hounds were well suited to pursuing quarry over long distances, overtaking it and bringing it to the ground usually with a mounted posse of men right behind to assist. Aluants were hounds that were said to be the strongest and best shaped of all hounds and they required more detail to training than other hounds to ensure it was manageable at all times. In fact it was written by Edward of Norwich that an alaunt could be either most gentle of nature or most vicious and indeed men were wounded and at times killed by their own alaunts. Not only are the alaunts the most strong but he writes they are also the most hare brained. The alaunt was able to run as fast as a greyhound over a short distance and any beast he could seize with his powerful jaws he could bring down with little effort and hold and not leave it. These hounds were used for bear and bull baiting in blood sports and also called great butchers’ hounds because they were kept by urban butchers to guard and to clean up the mess that went with the trade. They also served as protectors of their master’s home. Mastiffs were primarily hounds used to guard their medieval master’s beasts, home and goods. They were considered ugly and churlish in shape and nature and loved for it. Occasionally mastiffs were bred for hunting wild boar or for retrieving prey taken by hawks. Of all the hounds the mastiff is the least described in the medieval books on hunting, suggesting that they were indeed more of a footnote if you will than a prized hound for the hunt. Spaniels were small hounds used for retrieving prey that was hot at a distance or taken by birds thus giving them a second name; birds of the hawk. and excelling in hunting quail and partridge. These hounds were also encouraged to swim and burrow for prey during the hunt but they were also considered a detriment among greyhounds for they would often chase whatever they found regardless of their masters wishes and lead the greyhounds into a chaotic dithering chase. Food....surviving the test of time! Will My Medieval Dress Fit Me? It's official! 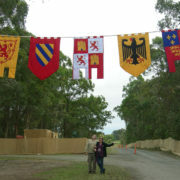 2012 Abbey Medieval Festival a "huge success"
Medieval Medicinal Herbs : Wound Herbs Food….surviving the test of time!